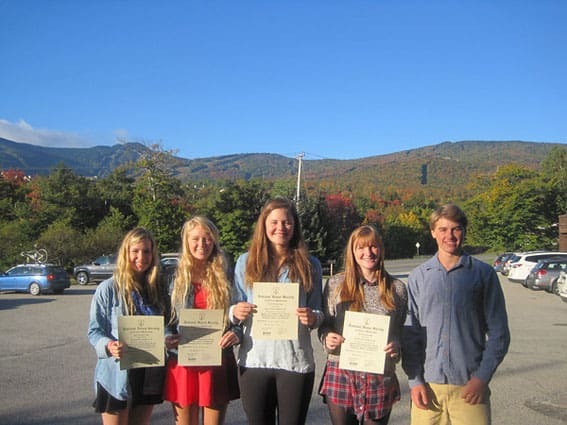 KILLINGTON—Killington Mountain School now has a chapter of the National Honor Society, and five KMS students were recently inducted into this longstanding organization, which recognizes outstanding high school students. Sophie Norton, Ava Mattsson, Cassidy Bebo, Piper Jenne, and Myles Frendel are the first group of KMS students to be inducted; the group recently received certificates indicating their acceptance, and they’ve already begun holding meetings. The mission of the National Honor Society aligns closely with KMS’s own mission. Overall, those chosen are bright, active, involved, engaged members of their community, who leave the world a better place than they found it. In order to be elected, students had to demonstrate scholastic aptitude, leadership, and involvement in community service. Along with the minimum GPA requirement, KMS applicants highlighted excellence awards, coaches’ awards, science awards, and placement on the honor roll in their applications. Interested students also had to demonstrate that they had held leadership roles. For the KMS applicants, this included things like serving as team captains and student council reps, assistant coaching, and working as newspaper editors. Service activities included involvement with the Trailblazers program, help with the KMS Dinner Auction, and involvement with the Kelly Brush Foundation. The five inductees will now choose and coordinate a service project as a part of their membership requirements. They have a KMS staff advisor, but the students will organize this project themselves from start to finish. In addition to this group requirement, there are also individual service requirements. KMS is proud of these five students and looks forward to a longstanding relationship with the National Honor Society. Donation box is full at Sunburg’s Sportsman’s cafe. I called number but says it is disconnected or not the right number.